A group of art students from Roosevelt Alternative High School have been engaged in a yearlong project that uses art to teach the scientific ideas behind human sustainability. After an inspiring tour of the Burpee Natural History Museum, the students’ artistic spirit culminated with them creating a large scale mural and other smaller pieces. These works will be featured in a Kortman Gallery exhibit titled “Gray Areas,” opening Friday, June 2nd. “Students with an interest in art and the ability to make deeper connections were chosen to tour the Burpee Museum and find issues related to Earth Science that they were most intrigued by,” says Kyle Wolfe, art instructor at Roosevelt. Inspired by Burpee’s Windows to Wilderness display, this group of young artists quickly began asking questions about how the environment could change if humans continue with the energy and environmental decisions they are currently making. Rockford artist Corey Hagberg came to Roosevelt to discuss his experiences as an artist and his time spent working with “En Masse,” a Canadian art collective, during projects in Chicago, Detroit and Florida. He worked with the students to create a background that would enhance the visual narrative the students were trying to convey. The students sketched and planned several images and then worked together to arrange these ideas into a large scale mural. According to Wolfe, the work represents the students’ opinions on human sustainability and where they see the world going if we continue with current policies and ideas about climate change. 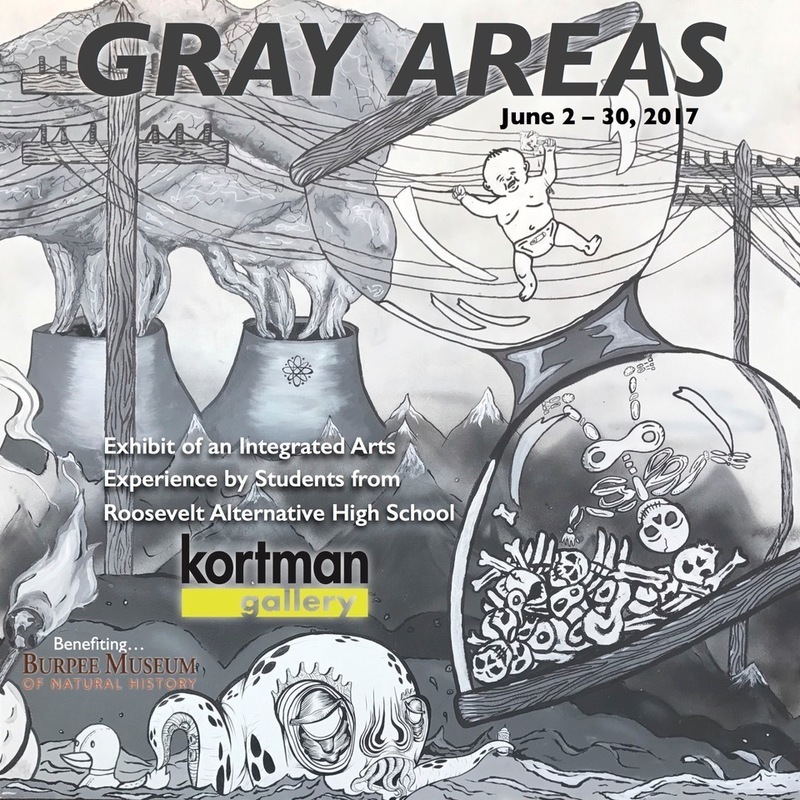 Opening reception for the “Gray Areas’ exhibition in the Kortman Gallery will be Friday, June 2nd, 5:30 to 9pm. It will be on display through June 30th. Kortman Gallery is located upstairs at J. R. Kortman Center for Design, 107 North Main Street in Downtown Rockford. The opening reception is free and open to the public. For more information call 815-968-0123 or visit www.jrkortman.com.